Readers who have read my autobiography, The Laundry Man (Penguin/Random House UK) know that the British Overseas Territory of Anguilla was a hotbed of money laundering in the 1980s, until reforms in the next decade more or less removed it as a jurisdiction favored as a destination for illicit wealth. Most of the overt money laundering has moved to independent East Caribbean States, where corrupt politicians have allowed it to flourish, in exchange for bribes and kickbacks. Financial crime had disappeared from Anguilla, or so I thought. 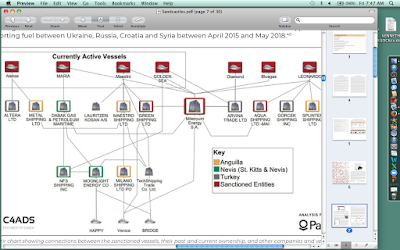 So why, in a white paper recently released on Dubai money laundering into real estate investments, do we see that several Anguilla corporations* have been employed to violate international sanctions on Syria ? 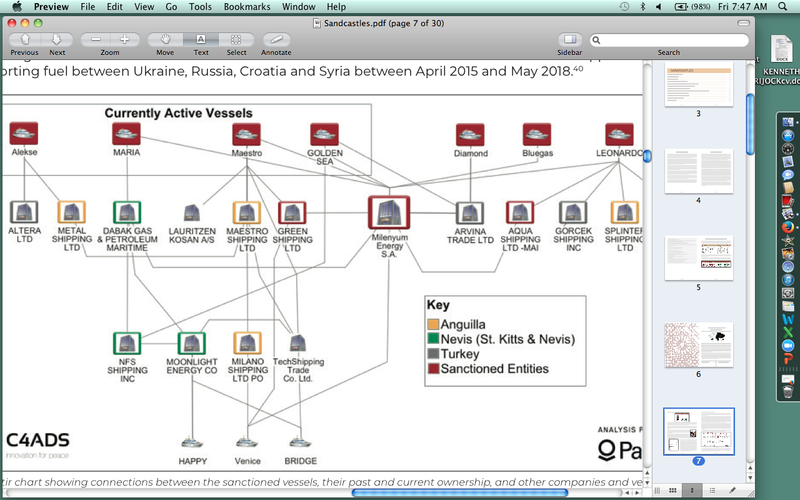 The companies were employed to own several commercial vessels that smuggled oil ftom Russia, the Ukraine and Croatia, into Syria. The Anguilla companies appear below marked with a yellow border. While there is little the Crown can do when Commonwealth states, which are independent sovereign nations, violate international (UN & US) sanctions, the Governor or the Foreign Office can certainly step in here in Anguilla, and reign in the lawyers who are forming these companies and sending them off to Syrian clients. The question is, will they do so ? * We see in the illustration above that St Kitts is also a jurisdiction where companies violating Syria sanctions were employed. Before St Christopher & Nevis became independent, it was linked to Anguilla, so I suspect the attorneys or corporate formation specialists who performed the legal services are the same.